I give illustrated talks to Years 5 – 8 on the themes behind my books, using images projected on a screen by some of the world’s great painters and illustrators to give the children a taster of Dante, classical myth and the First World War (Ante’s Inferno), or Elizabethan magic and the Faust legend (The Tragickall History of Henry Fowst). I make sure to involve the students all the way through, and give tips on how to create characters, structure a plot and write realistic dialogue. Allowing time for questions and discussion afterwards, the whole session comes to around 1 ¼ hours. I'll talk to any number of children, ranging from a few at a time to whole year groups. Most of my visits have been in Oxford and London but I'm happy to go further. I bring signed copies of my books for children to buy afterwards, if they wish, and usually a good number are excited enough by the story to do so. 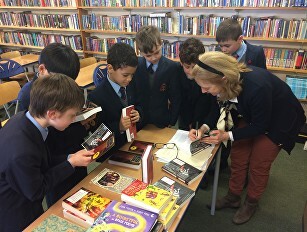 Since 2013, Ante’s Inferno has been adopted by Pegasus Primary School, Oxford, for their Year 6 Reading groups. The pupils enjoy the adventure story while discussing aspects of bullying, self-esteem and empowerment crucial to the plot – issues also tackled by the https://www.familylinks.org.uk/ nurturing programme which the whole school follows.